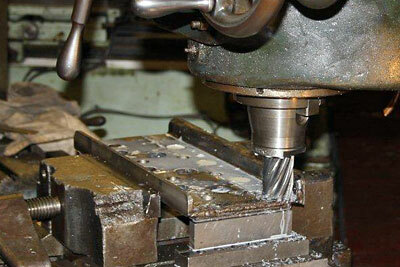 The machining of the manganese liner plates is drawing towards closure, to Richard's relief. David has made a counterboring tool to clean up the recesses for the bolt heads which will attach the liner plates to the horn guide and horn block castings. The next stage will be to equip ourselves with the necessary bolts and fit the liner plates to the castings. The rear of the loco footsteps and the cab footsteps are now complete. 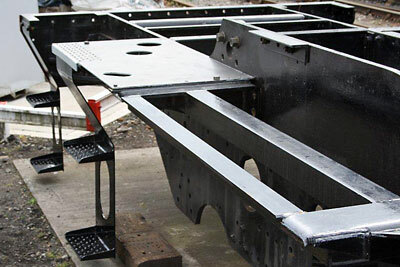 In the case of the latter we also have ready the section of footplating for the cab doorway area. We are assembling some brackets for supporting the injectors which are located behind the cab footsteps on the fireman's side of the loco. We have ordered the steel for fabricating the sandboxes. The keen eyed observer may have noticed a lifting gantry frame positioned over the chassis. This is to assist with preparation work prior to riveting. We have been able to purchase some parts, which are now safely stored away from the SVR, for use when the construction of the loco is more advanced and we thank the people concerned for offering us the opportunity to acquire these items. The Annual General Meeting on March 31st at Kidderminster was, again, a pleasant and upbeat event, with 56 people attending and well over 40 apologies. It was nice to be able to refer to the minutes of the 2011 AGM and report that all the predictions for progress over the following twelve months had been fulfilled. With the cylinders on order, the funds in hand to pay for the whole cylinder job, and the Wheel Appeal getting off to a fine start (see below), let's keep our fingers crossed that we will be able to say the same at the 2013 AGM! Largely as a result of the appeal in SVR News in early March, I am pleased to report that this has made excellent progress and we are now over half way towards the cost of having the six driving wheels cast from our pattern. Many thanks to all those who are contributing to the Appeal, and particular thanks to SVR News Editor David Williams for his unfailing support for 82045. Chris visited Oxford at the end of March to give a talk to members of the Oxford branch of the Great Western Society, which turned out to be a very pleasant evening, despite some trepidation at the thought of speaking to a bunch of dyed-in-the-wool GWR men (and women) and has resulted in a very generous cash donation to the Trust from one of those attending, as well as a number of new members. If any of you are reading this, Chris would like to thank you for the friendly welcome and especially for the little packet of tea-bags (there weren't any in the hotel room)! The following week, he gave a talk at Bridgnorth to the local branch of the SVRA, again a very pleasant and positive experience, which resulted in another generous donation from an existing member, as well as recruiting some new members. Thanks to all concerned. The current issue of Steam Railway contains an article about the project, plus a full-page advertisement with Wheel Appeal coupon. We hope that this will bring in some new members from outside the SVR. In this connection, we have about 4% of overall SVR membership supporting the Trust. There is no doubt that this could be improved on, and we will continue to make all-out efforts to increase support for 82045, while bearing in mind that there are many other competing claims on people's money on the Railway, and that these are not the rosiest economic times for us all. We would like, in particular, to see more of the younger footplate-grade members of the SVR coming forward: after all, they will be in their prime and enjoying 82045 long after we are gone. I know you can't twist people's arms, but come on, gents (and ladies), please support your Railway's new engine - the SVR needs it, and we are doing our best to build it as quickly as we can.